SILC | My House Oatlands Company Inc.
My House Oatlands Company Inc.
My House Oatlands (MHO) supports three boys with autism who live in a house at Oatlands in Sydney. MHO was established in 2013, as a supported independent living service to accommodate three teenage boys with autism, whose three families agreed to pool their sons’ funding packages to make it financially viable to provide the service. MHO has created a home away from home for their boys and is family governed with the support of SILC. The Board of MHO comprises of the parents of the boys and they meet every 3 months with SILC and the House Coordinator. •	Flexible service arrangements. MHO currently has one boy living fulltime, one boy 5 days a week and the other 4 days a week. The boys have made significant improvements during their time at MHO, in particular with their independence skills. They participate in the general running of the home such as cooking, gardening, cutting the lawns, hanging out the washing and much more. The best thing about MHO is that the boys enjoy being there! 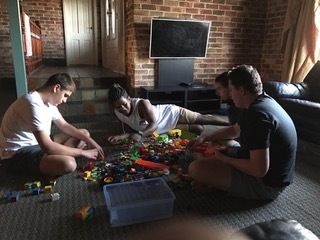 The 3 boys working with lego at their house (MHO).